Check out these articles for helpful tips, local events, and sometimes random tidbits I feel like sharing. If there is a topic you would like to see covered in a future post, just let me know. Last fall Meredith and I embarked on a DIY project in our kitchen. You see, we had been living with a half-done kitchen for years. About seven years ago we replaced our original white laminate counters with granite, changed out the square white porcelain backsplash for contemporary gray glass tile, and painted the walls a gray that tied everything together. Well, almost everything. 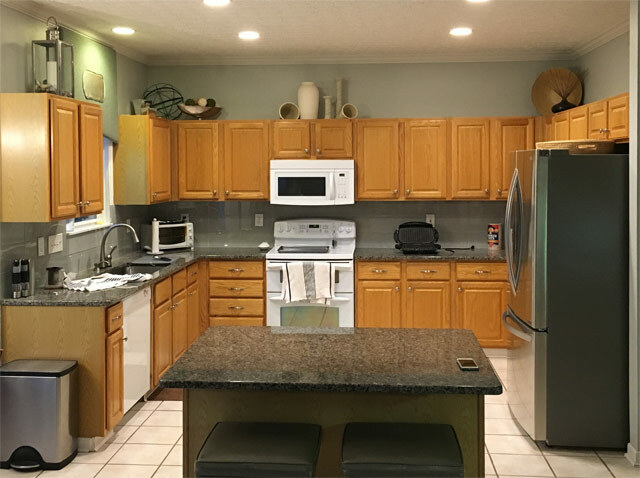 We were so eager to make a change in the kitchen that rather than delay our gratification a little while longer so we could save for new cabinets as well, we just kept the builder-grade oak cabinets, hoping they would at least look better after the upgrade. I’m sure you can guess how that turned out. In fact, we hated those cabinets more after our update than before. Against the gray tones of our new kitchen, the cabinets looked orange. And by installing granite on top of our old cabinets, we locked ourselves into keeping them. For years we debated how to best fix the problem. We could pay a refacing company lots of money to change them for us. That didn’t seem like a great idea, since we have lots of other places we preferred to use that money. I suggested that I could reface them myself. I’m pretty handy, after all. Meredith just laughed at that idea, reminding me of the half-finished bookcases I still need to finish in our basement. Or we could paint them. Meredith assured me they would look 10 times better if we painted them. I fought her on it. After seven years of this debate, I finally agreed that she was probably right. We chose a paint color, and I started lots of research about how to paint kitchen cabinets so they will look great and be durable. I’d like to share our process here. I don’t have a huge list of activities for you this weekend, but there are some good ones below. My weekend will be a mix of ugly and beautiful. Tomorrow I will be doing trash-out and demo on my latest flip project (because I can’t get enough of real estate! ), and I will head to the Short North with Meredith for date night at Hyde Park before Restaurant Week ends. Keep an eye on my Facebook page tomorrow for a “before” tour of the house! It’s by no means warm outside, but after the past week or two it’s starting to feel downright balmy! It’s a great weekend to finally leave the confines of home where most of us have spent the last two weeks and get out among other people. Coincidentally, there are lots of great things happening around town this weekend. So sit home if you prefer (I won’t judge you), or head out for a night on the town. 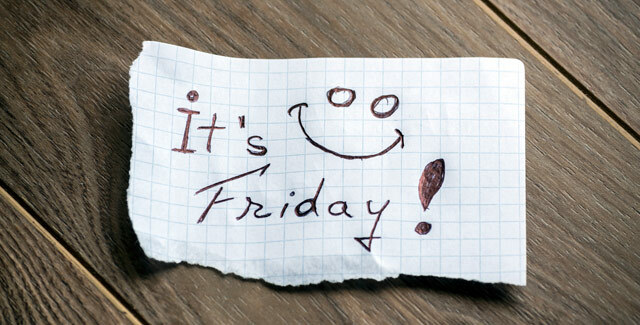 Either way, have a great weekend! Oh, and one other thing. If you see Meredith Liepelt today, wish her a happy birthday! It’s getting nasty out there this afternoon as we prepare for more precipitation. As I type this, the Weather Channel is saying we expect to see 3 to 5 inches of snow this evening on top of the wet roads we’ve had all day. 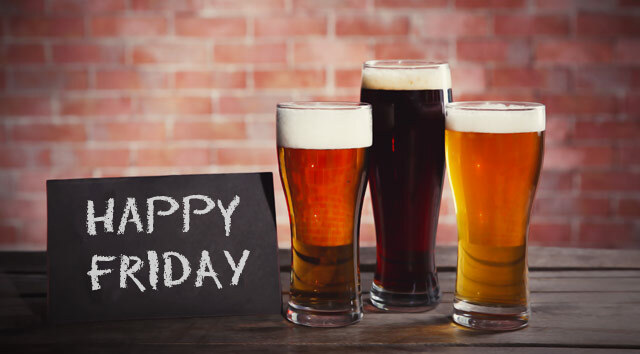 Even with the inclement weather hitting, it is still Friday, so it’s time for a quick run down on some of the activities happening in and around Columbus this weekend. Be careful out there, and have fun this weekend! Hello friends! I’m back after a little holiday break with your list of events happening in Columbus this weekend. It promises to stay chilly this weekend, so if you head out, be sure to bundle up. 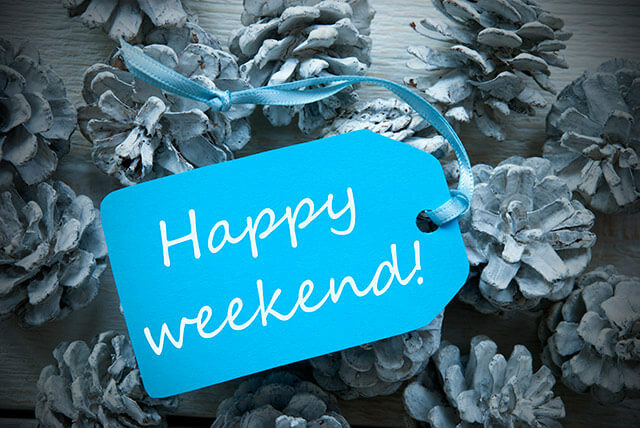 But whether you brave the elements or decide to stay home by the fire, I hope you have a great weekend!